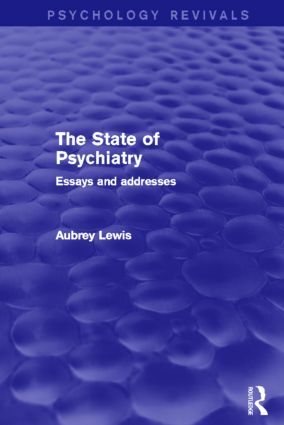 To mark his retirement in 1966 from the Professorship of Psychiatry at the University of London, and the directorship of the Institute of Psychiatry, the Maudsley Hospital, Professor Lewis’s students edited and prepared an edition of his collected papers, in two volumes. Originally published in 1967 this volume reviews the psychiatric past, surveys the transitional stage psychiatry had reached, and looks forward to the attainable future. The author pays much attention to disputed areas of psychiatric practice and inquiry, how psychiatrists should be chosen and educated, what concepts and methods are required for the furtherance of the subject, what part should social treatment and psychological treatment play. Today it can be read and enjoyed in its historical context.